You can start using Classter by creating a school or a teacher account to our free edition. Suitable for any K12 School from Kindergarten or Elementary to High School. Suitable for Vocational training centers, Colleges or Universities. Suitable for language or supplementary schools, music/dance academies or any other type of academic institute. Classter selected among the top 10 startups at the SXSW 2019! Classter.com is a global pioneer in Cloud-based SaaS, providing an all-in-one software solution: a student information (SIS), a school management (SMS) & a learning management (LMS) system. We currently have a network of business partners supporting our vision in 12 countries arround the globe. Admissions and registrations are tedious and complex processes. Classter will allow you to control effectively every aspect of these processes. You can easily manage candidates, documents, admission checklist, and applications. Students and parents can complete their enrollment online following a simple process, while at the same time the admission office gets a notification. What is even more interesting, is the total management of Alumni relations with Classter CRM features, allowing you to remain in good standing with your contacts for a long time. The latest news in School & Learning Management, in your inbox! Χρησιμοποιώντας αυτή τη φόρμα συμφωνείτε με την αποθήκευση και τον χειρισμό των δεδομένων σας από αυτόν τον ιστότοπο. See for yourself why more than 200 Institutes from all educational stages trust Classter to bring their people, operations, and data together in one place. During the meeting, we will be able to understand better your institute configuration and give a short demo tailored to your needs. Are you ready to proceed? Schedule a meeting right away! 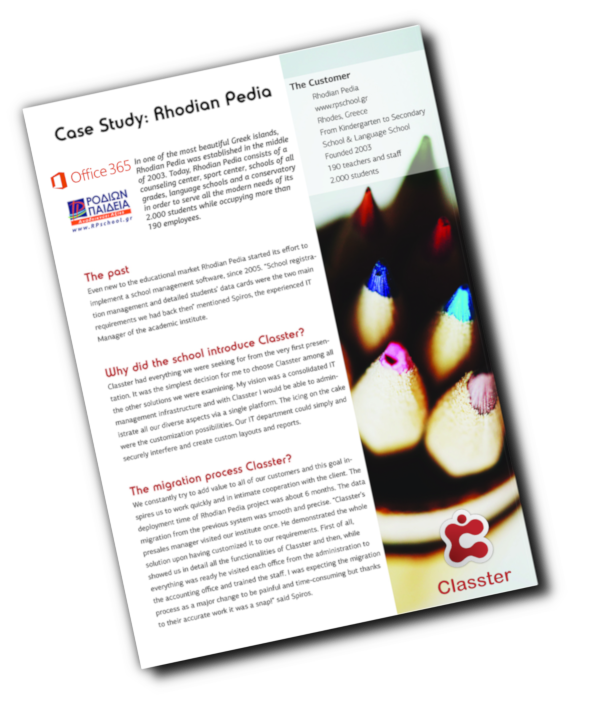 Download this Microsoft Case Study of how Rhodian Pedia school with more than 2000 students takes operations – and learning – to the next level with Classter and Office 365.